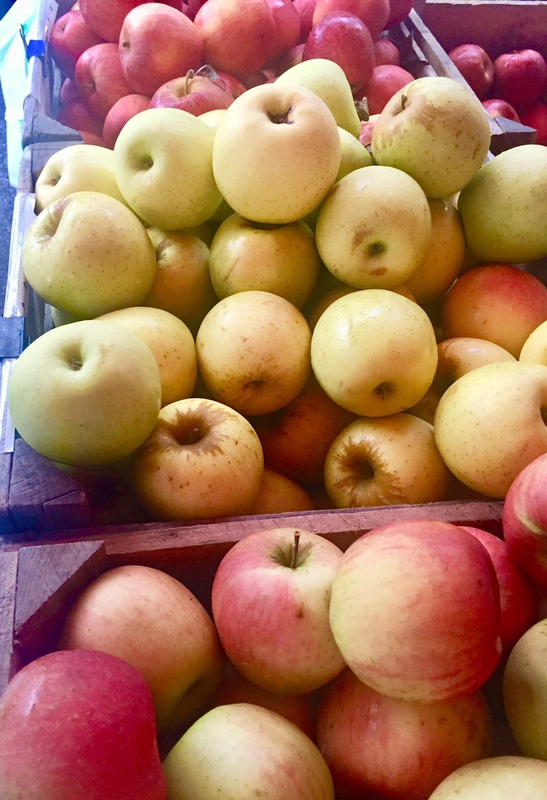 The original Tu B’shevat seder was originally created by 16th century Kabbalists who celebrated with a meal comprised of fruits and wines, each of whose color and shape offered mystical inspirations and teachings. It is common to include the “Seven Species of Israel” (shivat haminim) that are described in the Torah: wheat, barley, grapes, figs, pomegranates, olives and date syrup. People are also encouraged to eat as many seasonal “new fruits” as possible. The following dish that I created, filled with lots of in-season fruits and nuts, and many of the “seven species”, can be enjoyed as part of the main meal. PS: There are countless teachings and readings for the holiday, both old and new from rabbis, educators and organizations, offering mystical, spiritual, and activist teachings. And, there are lots of ways to get involved with Jewish environmental actions through many of the organizations on my blog resources page. 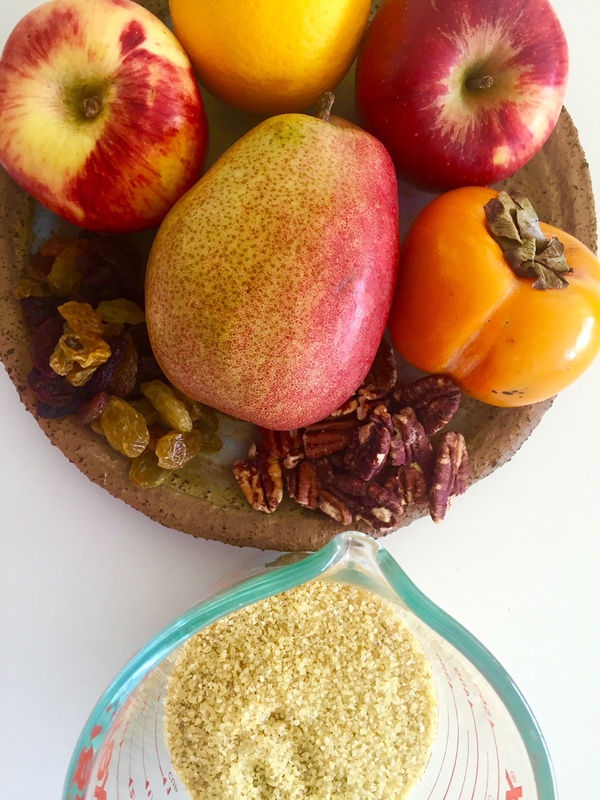 PPS: Click here for my other Tu B’shevat recipes. Prepare the barley. Add 1-cup dry wheat groats to 2 cups cold water in a pot. Cover with lid and bring to a boil. Reduce heat to a low simmer and cook until ready, approximately 20 minutes. Wash persimmon, apple and pear and cut into evenly shaped pieces (either wedges or cubes). Mix together olive oil, juice from half of the orange, wine and salt in a large bowl. Add fruit and toss well. 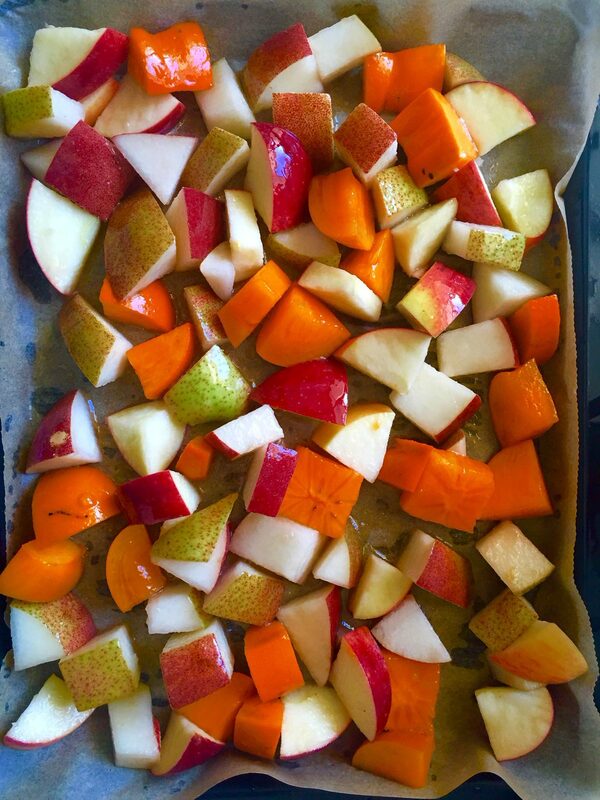 Place fruit on a parchment paper lined baking tray and put in oven at 375 F for approximately 40 minutes. The fruit should be soft and brown, but not too mushy when ready. Remove from oven and place in bowl with barley. Add raisins and walnuts and juice from other half of orange. Mix well. Optional to drizzle honey or date syrup on top and add extra salt to taste. 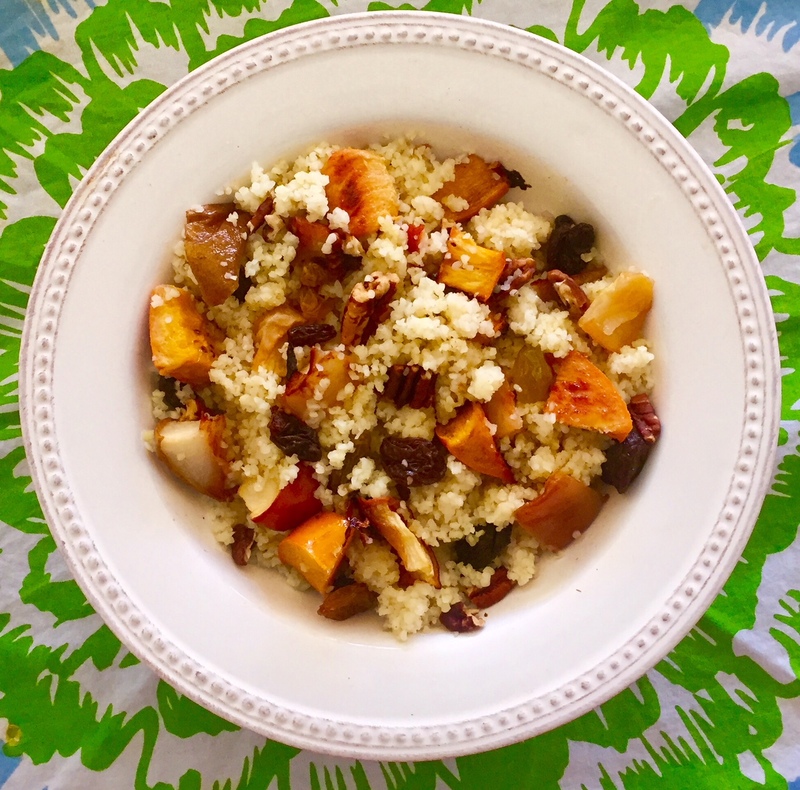 This entry was posted in Entree, Fruit, Holiday, Side dish, Tu B'shevat, vegetable and tagged cooking, dish, food, Holiday, jewish earth day, roasted fruit, Seder, sustainable agriculture, Tu B'shevat, vegan by Sarah Newman. Bookmark the permalink. What a delicious recipe! And thanks for listing so many environmental groups. Thanks-hope you have enjoy the holiday!